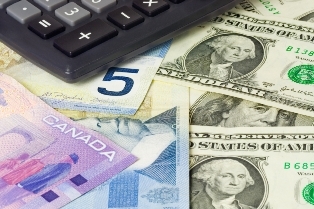 While it might not be the tonic to push the U.S. economy into overdrive, Dundee Economics Chief Economist Dr. Martin Murenbeeld believes the U.S. dollar will remain strong in 2016 while the Canadian dollar drifts lower in aid of Canada’s manufacturing sector. The U.S. dollar continues to be the go-to currency globally and that’s made the greenback overvalued, which in turn has put a governor on growth down south. Many in the U.S. would like to see a lower dollar to help boost the domestic economy; it’s likely to be an election issue as Americans head to the polls next November. But Murenbeeld doesn’t believe a lower dollar is in the cards, yet. As a result the U.S. economy isn’t expected to grow more than 2.0-2.5% in 2016 and exports are likely to be a drag on economic growth. “The U.S. dollar is too high. That doesn't mean it's going to come down soon. I would like it to, but markets are markets,” said Murenbeeld. “The strong U.S. dollar has negative impacts on the US economy; it tends to boost imports and reduce exports and it tends to dampen business investment. It also supresses the rate of inflation below the Fed target of 2%." At the end of the day Murenbeeld and the rest of Dundee’s economic braintrust see the Canadian dollar on the defensive for a number of quarters, until such a time as commodity prices bottom and turn bullish; late 2016 is their most likely scenario. Meanwhile, he sees the greenback remaining strong for the next four quarters while the yen, euro, and quite possibly the Chinese renminbi head lower.